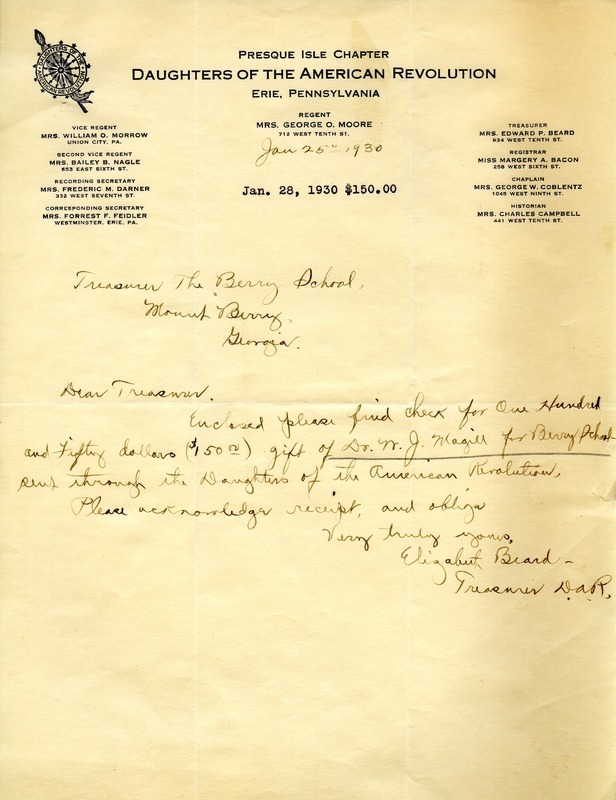 This letter is directed to the treasurer of the Berry Schools and regards a donation from Dr. N. J. Magill sent through the Presque Isle Chapter of the DAR to the Berry schools for 150 dollars. Mrs. Elizabeth Beard, “Letter to the Berry Schools from Elizabeth Beard.” Martha Berry Digital Archive. Eds. Schlitz, Stephanie A., Rachel Renaud, Chelsea Risley, Aaron Jackson, et al. Mount Berry: Berry College, 2012. accessed April 20, 2019, https://mbda.berry.edu/items/show/1483.